Just 4 of us in - but good banter nevertheless. A few in early evening gearing up for the monthly cheese night. Ramsgate Brewery (Gadds') - Empower Ale 4.00 A Gadd’s special for international Women’s Day. A very fine ruby ale. Dark Star - Hophead (some, if not most, also brewed by Fuller's) 3.80 New on - bit cloudy, needed a bit more settling time. Friday evening - good group of regulars. Chatted to Colin about the need for a tri-centennial event this year. There is tile above the fireplace bearing the date 1719. Opening time - lovely sunset over the wintry pond opposite. A dozen or so regulars in by the time I left. Ramsgate Brewery (Gadds') - ÜberHop 5.20 Really like this. Hopdaemon - Red 4.20 Good body, smooth. A miserable day for weather - but jolly banter, a coal fire and some roasted chestnuts at the Carpenters. Very pleasant. Colin, the landlord, tells us that the Rockin Robin brewery has closed down - tonight’s Reliant Robin one of the last barrels produced. Hopdaemon - Incubus 4.00 Fresh on to replace the HD Red. Hopdaemon - Red 4.20 Very smooth, full bodied ale in good condition. Early evening - filling up nicely with regulars and a couple of visitors from Holland. Kent - KGB 4.10 Well past its best - replacement offered without issue. Evening for the monthly book club meeting in the snug - coal fire on the go for us. Kent - Centennial 1918 2018 4.50 A very good pale ale from this consistently good brewer. Early evening - drinkers all outside -spread around the garden, the roadside bench and the duck pond opposite. Mobberley - Elysium 4.70 Top quality IPA in very good nick. Wednesday evening - a good crowd of locals and a visiting cycling group. Kent - Brewers Reserve 5.00 Top brew in good condition. Ramsgate Brewery (Gadds') - Wheelie 4.00 A very pleasant pale ale. Special charity brew “raising money for Oasis” - I assume that’s something other than a Gallagher brothers’ reunion. Ramsgate Brewery (Gadds') - No. 7 3.80 Not Tried Barrel just finished and replaced by a Gadd’s special. Evening visit, a good crowd of regulars in. BEER FESTIVAL here this weekend starting Friday 29 June. The pub will be open all day from noon on all 3 days. Village fete on the green opposite on Friday evening. Canterbury Ales (sometimes badged as Canterbrew) - The Pardoner's Ale 3.80 A little hazy. 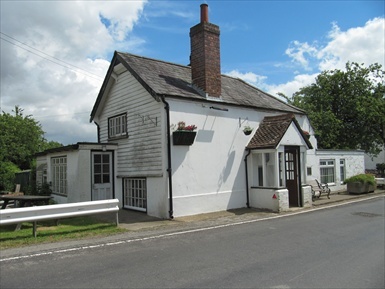 The pub is found in Coldred, Kent, CT15 5AJ. A rare 2 bar survivor of a traditional village boozer with roaring fires when appropriate. This pub is listed in the CAMRA National Inventory of unspoilt pubs. The pub boasts three skittle teams using the outdoor skittle alley. The landlady, Daphne Fagg (85) had been running the pub for over forty years until she recently passed away and the pub is now run by her son Colin. 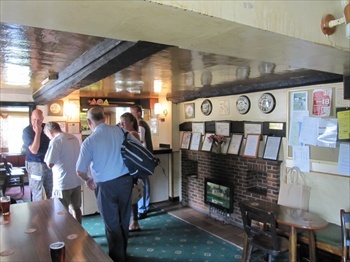 The pub does not normally open at lunchtimes, except by prior arrangement. Real ales sold via three active handpumps and bartop casks on gravity stillage. Dover, Deal & Sandwich CAMRA Branch Pub of the Year 2015. We have visited this pub 66 times, seen 101 different beers and tried 85 of them.